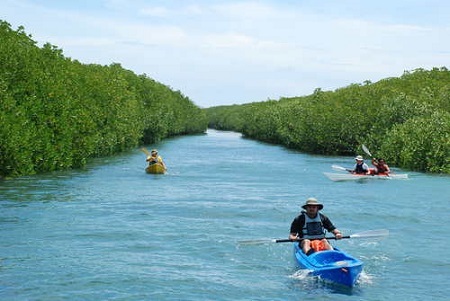 Bohol is blessed with mangrove forests around its river systems, estuaries and off shore islands. The island has one of the highest biologically diverse mangrove ecosystems with 26 mangrove species found on its shores. Out of 54 species of true mangrove (34 major and 20 minor) and 60 mangrove associates throughout the whole world, the Philippines has around 47 “true mangrove” and associated species belonging to 26 families. True mangrove species are those that strictly grow in the mangrove environment while associated species may thrive on other habitat types such as beach forest and lowland areas. Mangroves are salt-tolerant trees that have adapted to living in salt and brackish water conditions. 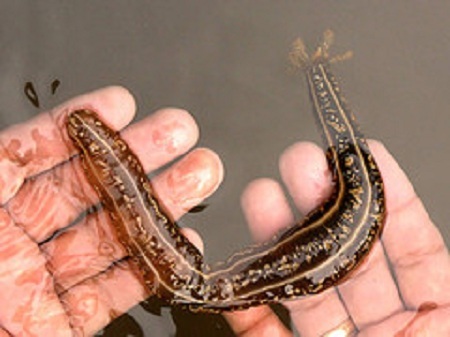 They vary in size from shrubs to tall trees and are found along sheltered tropical mudflats or wetlands or in association with estuaries and lagoons and may extend inland along rivers, streams and their tributaries. They require slow currents and plenty of fine sediment in which to set their roots. Mangroves are critical spawning, nursery, feeding and transient shelter areas to hundreds of fish species, crustaceans and invertebrates and support an abundant and productive marine life. Like all other animals, fish, shrimp, crab and other marine life in the sea need a safe place to grow, away from many predators. With their tangled and intricate root systems, mangroves are excellent nurseries, providing safe hiding places for young animals. The muddy waters around them are rich in nutrients from decaying leaves and organic matter produced by the mangroves themselves and also from the sediment that is trapped around the roots. Many commercial marine species such as bangus (milkfish) and prawns spend their early life within the mangrove area where they find food and protection from predators. Juveniles of some deep sea fishes also spend some time in the mangroves before moving on to other ecosystems such as sea grasses or coral reefs. 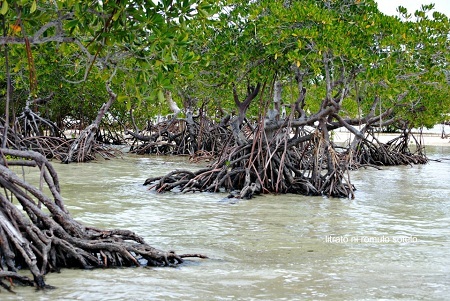 In addition, mangroves are also habitats to shore birds, some species of mammals (monkeys, rats, etc.) reptiles and insects. These animals utilize the mangroves as places to roost, breed or take shelter from strong winds or heat of the sun. They also serve as shoreline sentinels and pollution sink aside from being a source of firewood, poles, charcoal, and tannin. Mangrove leaves are a source of food for fish, shrimps and crabs and other marine animals. When a leaf falls, it breaks up and decomposes into smaller pieces, until they become too small to be seen by the naked eye. The decomposing plant matter is collectively known as detritus. Detritus is covered with large amount of small organisms which take up the nutrients in the leaves. Individually, these organisms are too small to be of much value to any larger animal, but together they form a coating around leaf particles which many different animals use as food. Leaves eaten by animals are not totally digested. They are excreted almost intact, again coated with organisms, and then eaten by marine animals. This process is repeated several times, so that one leaf can literally nourish a juvenile fish for much of its life in the mangrove area. 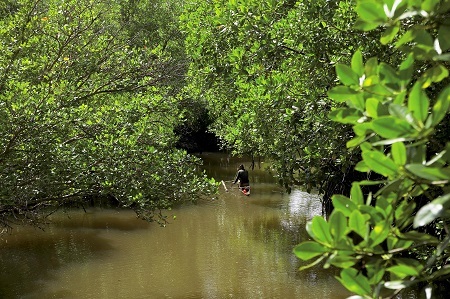 Mangroves contribute about 3.65 tons of litter per hectare per year. 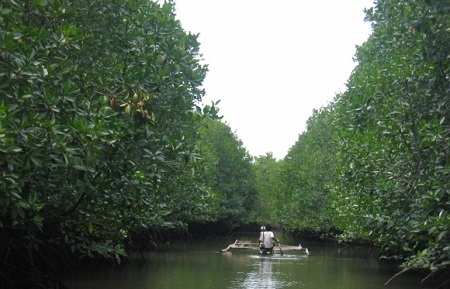 One hectare of healthy mangrove ecosystem produces about 1.08 tons of fish per year. 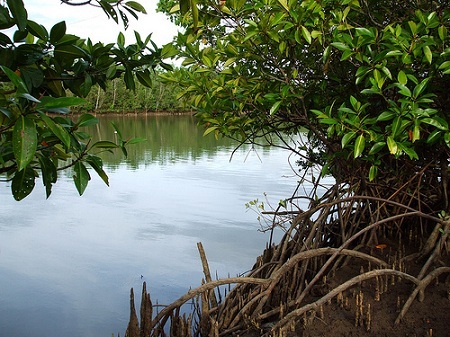 Mangroves protect coastlines from the onslaught of storms and wave surges. Their crowns, trunks and stems serve as physical barriers that help break the winds and waves, reducing their speed and intensity and subsequently their destructive impact. Scientists say that during such surges, at least 70-90 percent of the energy of wind-generated waves is absorbed, depending on how healthy these ecosystems are and their physical and ecological characteristics. Mangroves are also capable of absorbing pollutants such as heavy metals and other toxic substances as well as nutrients and suspended matter. Mangroves therefore serve as natural wastewater filters, preventing many land-based and near shore pollutants from reaching deeper waters. Mangroves are a good source of wood and timber, nipa shingles for housing materials, firewood and charcoal, and of poles for fish traps. 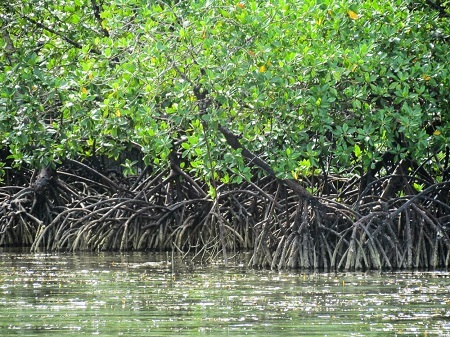 Several mangrove species provide high-quality commercial timber, used for various building materials as well as for fuel. In fact, in the Philippines, mangrove wood has been widely used as fuel for bakeries due to their high heat and charcoal value. Tannins from mangroves are also used to coat and preserve wood, nets and fishing gear as well as for cloth-dyeing. Some species of mangroves are also habitat to bees and are sources of honey and beeswax. As breeding and nursery grounds for many fish species, mangrove areas are sources of wild fry and juvenile fish for the aquaculture/mariculture industry. In addition, mangrove seeds and propagules can be harvested and sold to reforest denuded areas. 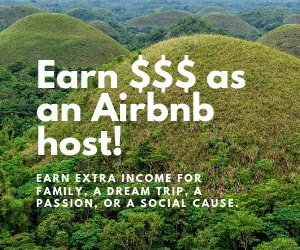 In the Philippines, it is estimated that the value of a complete mangrove ecosystem ranges from US$500 to US$1,550 per hectare per year or at US$600/ha/yr or US$60,000/sq. km/yr. The total gain to the Philippines for protecting its remaining mangrove ecosystem is substantial. Using the conservative estimate of value from direct benefits of only US$600/ha/yr, the Philippines gains at least US$83 million/year in fish production and potential sustainable wood harvest from the existing 138,000 ha.